There’s not much doubt that the Tampa Bay Lightning are currently the best team in the NHL, and the favorites to win the Stanley Cup. Even with the outstanding performance of the Vegas Golden Knights so far this season, not many would choose to face the Lightning over them in the first round of the playoffs. With two potential Hart Trophy candidates up front in Nikita Kucherov and Steven Stamkos, the Vezina front-runner in Andrei Vasilevskiy and a perennial Norris-level defenseman in Victor Hedman, the Lightning have impeccable strength at every position. Amazingly, it’s not just at the NHL level that they have talent. 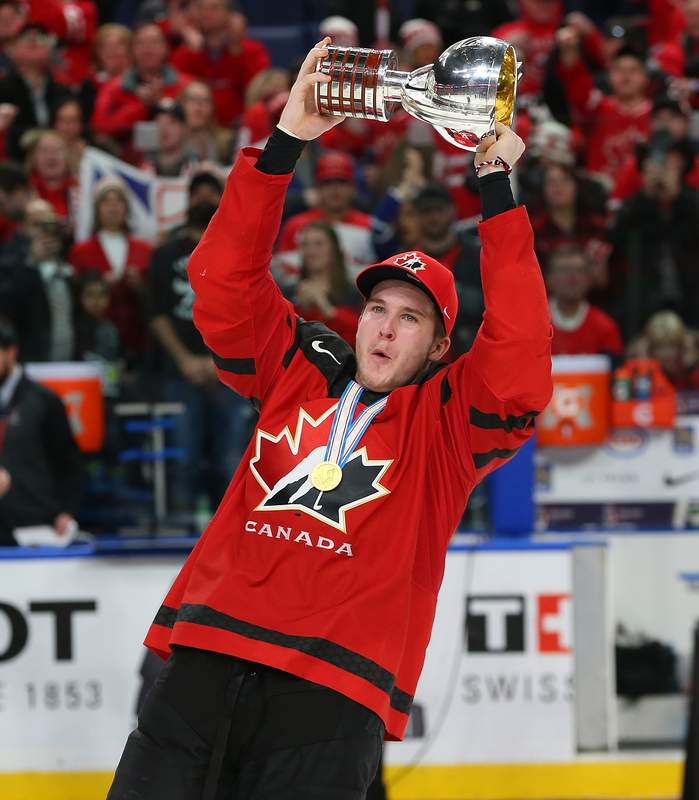 Brett Howden, Boris Katchouk, Taylor Raddysh and Cal Foote take home gold at the World Junior Championship, all four Tampa Bay Lightning prospects. Libor Hajek, who was traded earlier today in the WHL, logged huge minutes for his Czech squad en route to a fourth-place finish. That’s to say nothing of Mikhail Sergachev who could have represented Russia if he wasn’t already in the NHL, and the four other prospects who suited up last year. The Lightning have a true pipeline of talent coming through their system, and should be able to replace any outgoing players from within. But for this season, perhaps that load of prospect capital could be used to improve. Whether through dealing actual players, or the picks that Tampa Bay doesn’t desperately need this season, the Lightning could be big spenders at the deadline to make them even tougher down the stretch. When looking for cracks on the roster, there aren’t many. If there was one worry it could have been the play of Peter Budaj, who struggled until his recent injury. Louis Domingue may have solved that, acquired from the Arizona Coyotes and looking refreshed in the AHL and his Lightning debut this weekend. While Vasilevskiy is the clear starter, having a capable backup is key for any team looking for a Stanley Cup. Up front they possess perhaps more depth than any other team in the league. An incredible six forwards already have 30 points for the Lightning, with Ondrej Palat and Alex Killorn additionally notching 27 and 24 respectively. Even though Chris Kunitz and Ryan Callahan aren’t scoring, they provide some experience for a Stanley Cup run. One more scoring threat could help, but it certainly isn’t necessary. So then the last few spots on defense may be the easiest place to find an upgrade. Though Hedman and Anton Stralman are horses, they’re being relied on quite a bit for the Lightning both at even strength and on the penalty kill. Dan Girardi and Braydon Coburn, the other two penalty killing options for the club, aren’t very effective at even-strength. Both players have one more year on their contracts, but don’t seem particularly locked into a role for next season. Not, at least, if the Lightning can go out and find another top-4 option on the open market. It’s not like they don’t have internal options. Sergachev and Jake Dotchin have their place on the club, and both are getting increased minutes of late. Slater Koekkoek and Andrej Sustr are both still there, but neither have shown that they’re ready to step into a bigger role. Amazingly, the Lightning even have cap space to burn. Not going forward, as they’ll have to re-sign Kucherov before long and Vladislav Namestnikov is due for a new contract this summer. But for this year, according to CapFriendly they could add approximately $9MM in cap hits at the deadline and still stay cap compliant. That’s a huge number for a team that doesn’t have any glaring needs, and it could result in them stealing one of the top rentals to make them even better. That’s a scary thought for the rest of the Eastern Conference, and perhaps even the whole league. Injury news seems to be a daily affair in St. Louis as the St. Louis Blues are dealing multiple injuries at once, especially after the team learned that defenseman Jay Bouwmeester is expected to miss the weekend after he was put on injured reserve Friday with an unspecified injury, according to Tom Timmermann of the St. Louis Post-Dispatch. Now, Chris Pinkert of NHL.com writes that the team has a new injury to worry about as the team’s fourth-line center, Kyle Brodziak, is likely to miss Saturday’s game and is day-to-day with an unknown injury. Timmerman adds in a tweet that defenseman Alex Pietrangelo is making progress, but his status for Sunday’s game (the first game he is eligible for against the Winnipeg Jets is unknown. The scribe points out, however, that since it’s the second game of a home-and-home against the Jets, it’s unlikely the team would carry just six defensemen for two straight games, which suggests the team is confident that Pietrangelo will likely play on Sunday. Another factor on defense was the status of veteran defenseman Carl Gunnarsson, whose status was questionable Friday after taking a shot off his right leg, which forced him to leave practice yesterday. Pinkert adds that he’s OK and is expected to play Saturday. Tampa Bay Times’ Joe Smith tweets that defenseman Braydon Coburn is likely to return tonight against the Avalanche. Coburn has missed seven games and hasn’t played since Nov. 29 with a lower-body injury. The 32-year-old veteran has seven assists in 25 games this season. With Minnesota Wild defenseman Jared Spurgeon not playing in today’s matchup against the Oilers, The Athletic’s Michael Russo tweets that it’s likely that Spurgeon will return to the Wild for tomorrow’s matchup with the Blackhawks. He has missed nine games for Minnesota with a groin injury. The 28-year-old has three goals and 12 assists in 23 games this season. Las Vegas Review-Journal’s Steve Carp tweets that winger William Carrier, who has missed nine straight games with an upper-body injury, continues to practice in a non-contact jersey, but a return could be coming soon. Carrier’s presence and toughness has been missed. He has one goal and one assist in 20 games. The Chicago Tribune’s Chris Hine tweets that Cody Franson and Jan Rutta could be back on the ice soon, possibly even tomorrow, according to coach Joel Quenneville. Franson has missed three games with an upper-body injury, while Rutta missed Thursday’s game against Winnipeg with an apparent head injury. Postmedia’s Wes Gilbertson tweets that Jaromir Jagr is expected back into the lineup today after missing the past six games with a lower-body injury. He is expected to play on the team’s fourth line tonight. The Tampa Bay Lightning have the best record in hockey, but are dealing with their fair share of bumps and bruises right now. The only major injury on the roster belongs to defenseman Jake Dotchin, who has been sidelined with an undisclosed and reportedly “freak” injury for the past two weeks. However, the Tampa Bay Times’ Joe Smith writes that Dotchin was back at practice today and could soon return to action. The Bolts have the luxury of easing Dotchin back into the lineup – he was still donning a red “no-contact” jersey today – due to both the team’s success and sufficient depth of talent on the blue line. Nevertheless, the strong defensive presence that Dotchin brings paired nicely with All-Star Victor Hedman as the team’s top duo and coach John Cooper is surely eager to get his defensive groupings back together. Another barrier to that task could be lingering health issues with Braydon Coburn. The veteran stay-at-home defender is also banged-up and unable to play due to an undisclosed injury. Coburn missed the Lightning’s last game and tonight’s contest and there is no word on when he will return. Although the Bolts still have a solid six without Dotchin and Coburn, the team still went ahead and recalled Jamie McBain from the AHL’s Syracuse Crunch, the team announced. McBain was on hand for tonight’s game, but did not suit up for Tampa against the New York Islanders. McBain, 29, has had a strong 2017-18 campaign in the AHL thus far and will continue to be a reliable backup option for the Lightning should their blue line injuries persist. It has been rumored for some time that the Tampa Bay Lightning and GM Steve Yzerman had struck a deal with the Vegas Golden Knights and GM George McPhee to steer them away from certain players. The Tampa Bay Times’ Joe Smith has added some concrete names to that speculation this afternoon, reporting that Vegas would not select young Bolts’ defensemen Jake Dotchin and Slater Koekkoek. The pair were left exposed as Tampa Bay chose to protect Norris Trophy finalist Victor Hedman, his partner Anton Stralman, and veteran Braydon Coburn. So what is the deal that protected the pair? Speculation earlier today from Smith was that the Lightning may be offering up the rights to prominent Russian prospect Nikita Gusev as part of the deal. 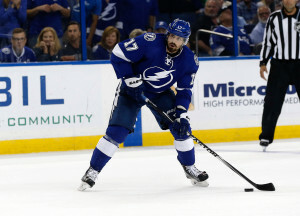 Smith pondered if that would be in exchange for protecting the young defenseman or in exchange for selecting the bad contract of veteran blue liner Jason Garrison. While it still remains unknown who the Knights will take from Tampa, the confirmation that it will not be Dotchin or Koekkoek alone could mean that Gusev is on his way to Vegas, where former SKA St. Petersburg teammate Vadim Shipachyov has already signed. We’re continuing to break down each team’s situation as it pertains to the 2017 NHL Expansion Draft, coming up next week: which players are eligible, and which will likely warrant protection or may be on the block. Each team is required to submit their protection lists by 4pm CDT on June 17th. The full rules on eligibility can be found here, and CapFriendly has provided a handy expansion tool to make your own lists. Steve Yzerman fired the first shot in the pre-expansion draft trade market by acquiring Mikhail Sergachev from Montreal for Jonathan Drouin, a move that gave the Lightning flexibility both with the cap and their expansion protection list. It also filled a need with the Bolts on defense. With that in mind, it makes Yzerman and the Lightning’s decisions slightly easier as to who to protect and who to expose. But there are still some tough choices to make. Unloading Drouin certainly helped from a financial and expansion list aspect. This makes it somewhat easier for forwards to put on the protected list. Ondrej Palat and Alex Killorn are both choices that benefitted from Drouin being moved. Killorn netted 19 goals while Palat will continue to get better. Stamkos and Callahan both have NMCs. Despite fighting injury and not matching his production from 2014-15, Johnson is too good of a talent to leave exposed. It’s on defense where tougher decisions need to be made, and it will come down to three players. Hedman and Stralman will both be protected, Hedman because he has a no-movement clause and Stralman is key to the Lightning blueline. Jason Garrison and Braydon Coburn are both carrying heavier hits for the cap and will most likely be left alone when they’re exposed. Garrison could hypothetically be taken with his deal ending at the conclusion of the 2017-18 season, but the $4.6MM hit would probably scare Vegas away. That leaves three choices to protect: Andrej Sustr, Jake Dotchin, and Slater Koekkoek. Sustr is a restricted free agent and won’t be able to command much in the way of money after having a down year. That doesn’t make him exempt from being exposed. If anything, seeing his numbers drop with a number of other options pounding on the door for the big club could make him the odd man out. However, he’s still an economical option and any leverage he had took a hit with the acquisition of Sergachev, who if scouting is correct, should find time on the Tampa blueline next season. But the problem with protecting Sustr is that Tampa would risk losing two young, and talented defensemen for nothing. In the same breath, would the Bolts want to possibly lose a steady defenseman who is only 26? That leads to Dotchin and Koekkoek. Dotchin just turned 23, and registered 11 points in 35 games this season. The problem is, as Lightning blog Raw Charge pointed out, his sample size was limited compared to Koekkoek while being paired with Hedman. The 23-year-old Koekkoek logged 41 games over the past two seasons, but played strong for AHL affiliate Syracuse during the Calder Cup playoffs. Picking between them is essentially splitting hairs. Koekkoek appears to have the higher ceiling, and plays a cleaner game than Dotchin. Though they play different games, Yzerman might prefer a more disciplined, puck moving defenseman when choosing who to protect. At the same time, Dotchin plays a physical game, and can move the puck as well. He’s not afraid to muck it up, and provides a presence that protects his teammates on the ice–while still contributing on the score sheet. As Tampa Bay Times beat writer Joe Smith wrote, Dotchin has stood out to management, especially in the NHL and AHL during Syracuse’s Calder Cup Final run. With two younger defensive prospects and after having a less than stellar season, predict Sustr to be exposed and Koekkoek protected. Don’t be surprised, as many others have written, if Yzerman pulls something off to keep all of his young defensemen so Dotchin remains in the fold. Vasilevskiy is truly the only option to protect as 24-year-old netminder Kristers Gudlevskis is unlikely to be taken with other options presumably available from other teams. Of the decisions, it seems to be the least of Tampa’s worries. The Lightning, despite missing the playoffs and sustaining injuries to one key player after another, still have a strong lineup that will absolutely compete next season. Peddling Drouin off certainly helped matters, but the third player to protect defensively is a tough decision to make. At the end of the day, though, Yzerman has shown skills deft enough to take a challenging situation and somehow make it work out. Don’t be surprised if he finds a way to do it again. The recent run of the St. Louis Blues has all of a sudden made their decision regarding pending unrestricted free agent defenseman Kevin Shattenkirk a much more difficult one, writes Bruce Garrioch of the Ottawa Sun in his latest Insider Trading column. It has long been believed that the Blues – who aren’t expected to re-sign him – were hoping to move him in an effort to avoid losing him for nothing in July but with the team now sitting somewhat comfortably in a playoff spot, it’s a much tougher sell as moving him would hurt their fortunes considerably. The asking price from GM Doug Armstrong remains quite high, including a first round pick, a high quality prospect, plus a third element. If he can get all of that in a return, moving him even while in a playoff spot would be a lot more palatable but there’s little indication at this time that anyone is willing to meet that price for a rental player, even the top one on the market. Lightning GM Steve Yzerman is looking to free up some cap space beyond this season with players like Ondrej Palat, Tyler Johnson, and Jonathan Drouin all headed for restricted free agency. 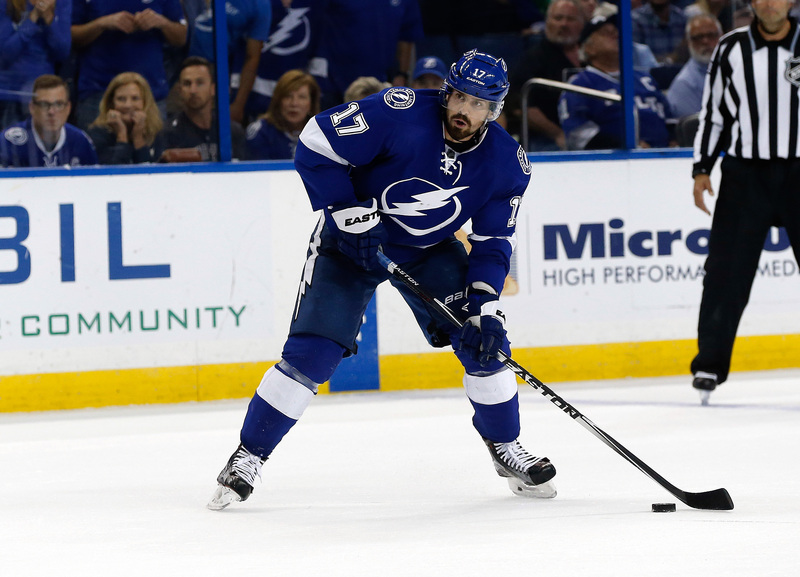 A couple of players they’d like to move are defensemen Braydon Coburn and Jason Garrison. Coburn has two years left on his deal after this one with a $3.75MM cap hit while Garrison has one year remaining at $4.7MM. However, Yzerman will need to provide some sort of incentive to get a team to take on one of those deals and while it appears he’s willing to do so, the question becomes how much of a sweetener would they be willing to part with? On top of pending UFA Thomas Vanek, the Red Wings are looking to find a new home for winger Tomas Jurco. It came out last month that the 24 year was hoping to be dealt as he has spent a significant portion of this season as a healthy scratch. While it’s likely that GM Ken Holland would like to move some players with term left on their deals, that will be quite difficult as quite a few are on long-term pacts and are underachieving this season. Golden Knights GM George McPhee reached out to now-Canadiens coach Claude Julien after he was let go by the Bruins but clearly no deal was reached. Considering Julien was primed to be in a spot to be very selective about where he went if he waited until the offseason and the likelihood that the expansion team struggles out of the gate, he likely wouldn’t have been the right fit in Vegas anyways. The scribe suggests that former Florida bench boss Gerard Gallant remains the favorite to get the job although ex-Islanders coach Jack Capuano has also been interviewed. After trading Nikita Nesterov the other day to the Montreal Canadiens for a relatively small return, some thought that it would open the door for Slater Koekkoek’s return to the team. Don’t count on it, as Steve Yzerman told Joe Smith of the Tampa Bay Times yesterday. He’s an important part of our future, and I see a very bright future for him still. So if we need a left shot or we feel Slater will come up and play a lot, then I’ll bring him back up. That’s a good point when it comes to the former 10th-overall pick. If he’s not going to play big minutes with the club, it may be better for his development to stay in the AHL. With Victor Hedman, Jason Garrison and Braydon Coburn locked into the left-side, it doesn’t seem like there would be a lot of time for him. The team is looking to pull off more moves in the near future, but one player that hasn’t been approached yet is Ryan Callahan. The injured alternate captain has just four points this season and holds a full no-movement clause in his contract. That means he’ll force protection in the upcoming expansion draft, a spot that the Lightning could really use for a different player. Players can opt to waive their NMC in order to be exposed at the draft, but since they’ve earned the right to have it in their contracts it’s hard to ask them. Smith says that the team does want to move Ben Bishop if possible before losing him for nothing this summer. The upcoming free agent has had a season troubled by injuries and inconsistency but still represents a potential upgrade in net for many contenders. A two-time finalist for the Vezina trophy, Bishop holds a career .919 save percentage. One of the reasons for the Nesterov trade apparently was Luke Witkowski, who the team didn’t want to lose on waivers. Instead they dealt Nesterov, who would have been a restricted free agent this summer for a team that will have a real cap crunch. Tyler Johnson, Ondrej Palat and Jonathan Drouin will all need new deals this summer. The Florida Panthers announced that they have placed center Nick Bjugstad on injured reserve. He suffered a lower body injury last night against the Predators early in the game and did not return. George Richards of the Miami Herald reports (Twitter link) that he’ll miss a couple of weeks and that it’s a groin issue. To say that this season has been a struggle for Bjugstad would be an understatement. He broke his hand in the preseason which kept him out of the lineup until November 22nd and since then, he has scored just one goal and one assist in 21 games, despite seeing quite a bit of time in the top six. He also has found himself shuffled to the right wing more frequently than he has been accustomed to. With Roberto Luongo being a late scratch yesterday due to an upper body injury, the Panthers also recalled goaltender Sam Brittain from Manchester of the ECHL. He’s expected to serve as James Reimer’s backup tonight against Boston if Luongo is unable to dress. Maple Leafs center Ben Smith and defenseman Martin Marincin are skating but are not close to returning to the lineup, reports Lance Hornby of the Toronto Sun (Twitter link). Marincin has been out since December 11th with a lower body while Smith has been sidelined since undergoing hand surgery on December 19th. Although he started skating this week, Winnipeg blueliner Tyler Myers is expected to miss at least another week as he continues to recover from a lower body injury, reports Jeff Hamilton of the Winnipeg Free Press. He will miss his 25th straight game tonight and has five points (2-3-5) in 11 contests this year. The Senators will activate center Zack Smith off IR and expect to have him in the lineup tonight against the Capitals, the team announced via Twitter. The 28 year old missed the last two games with an upper body injury and has 15 points (8-7-15) in 35 games this season. Tampa Bay defenseman Braydon Coburn is day-to-day with an upper body injury and will not suit up today against the Flyers, reports Bryan Burns of the teams’ website (Twitter link). Coburn had played in every game this season heading into this one, picking up a goal and four assists but is averaging his lowest ice time per night (15:56) since his rookie season back in 2006-07.